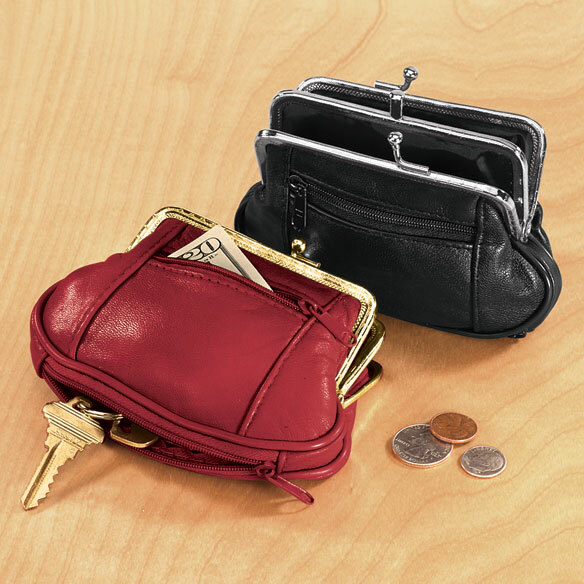 Cute little leather coin purse clutch features more pockets than most—four in all! Leather pouch purse's metal frame twists open for quick access to double inner pockets; outside has side and bottom zipper pockets. Leather clutch purse compact size slips easily into handbag or pocket. Specify color: black or red. 4" L x 5 1/2" W.
You ha e a place for cards, money and change. Glad to find this item! Best coin purse ever - haven't been without one in 20 years! Have had one of these for more than 20 years - replacing about every 5 years. I always get Red so I can find it easily in black bags. Spare key in bottom zip, cash on one side, ccs on the other. Fits perfectly in jeans pocket so no need for a tempting purse for a thief. Have two spares in a drawer for when its time to replace as I am afraid one day they will no longer be available. Buy 2 or 3 at a time!! Enjoy. Perfect to fit in your pocket. No need for a purse. Great for running errands. Zippered pocket perfect size for currency. Other pockets perfect size for ID, credit cards, etc. Colors are very good (could have more variety). An I.D. or credit card even can fit in one side next to bills and change on other side. I put my medicine pod in the outside zipper slot. The zipper on bottom could be used for maybe larger bills you want separate like I would on those flea market or carnival trips. You don't want to carry a purse and this fits in a pocket. Extremely please with purchase. High quality. I ordered one, and after using it got two more. Meets all my needs, and the color (red) is easy to find in my purse. I had been looking for this coin purse for well over a year.Upscale stores [...].I was searching Estate Sales and Thrift stores.I filally went to my shoe repair man and he suggested the internet.Much to my delight I found it and ordered not only one but two.I love it! The only coin purse my mom uses! Easy access and wears in we'll,long lasting as well. The best coin purse I have ever brought. I like this coin purse so much, I plan on giving it for birthday and Christmas gifts next year. Hello, This Coin Purse is Perfect! if you are looking for a coin purse look no further. This coin purse is not just beautiful, it is soft like very real soft real expensive leather also the colors are beautiful! There are 3 compartments and they are nice and roomy. I cannot say enough about this perfect coin purse, Thank You so much Miles Kimball, You have done it again. Find it the correct size to carry money and other items for safety reasons. I like the colors it comes in, though it would be nice if it came in purple also. Personally, I like to give them as small tokens of appreciation to friends and people special to me. 5 Star - I would certainly order again. High quality leather. Great xmas stocking stuffers. I would order again. My daughter had seen my coin purse and said she thought she would like one too. So I gave her one for Christmas and she loves it! I gave two of the red purses for Christmas gifts. They were an attractive red color with 4 adequate compartments for jewelry, cosmetics, medicine, coins, currency, tissues, whatever. I also ordered a black one , but the red was more imppressive. this is the 2nd one of these little wallets that I have bought, my God-daughter saw mine and loved it so got her one for valentine's day. They are extremely handy with all kinds of places to put stuff, well constructed and one of the best buys I have ever made. Nice leather, lots of room, two zippered pockets also. Great in a purse but also if you don't want to take a purse with you. It has plenty of compartments. love that it holds just what I need. I quick grab it and head out the door when I don't want to carry a purse. It fits nicely in a pocket, so you have your hands free. When I travel I put it on the bottom of my purse so it is not visible , and since I bought the red I can see it when I need it. This is the second time or maybe 3rd time I have bought it. It not a high quality but it wears very good for the price. I won't live without it due to its the perfect size for me and carries everything I need , including a key or two . I bought one in each color! I love this coin purse, especially the pockets. I have one in both colors, and I've used them daily. The very best coin purse around. Over the years, have bought at least 10 - gifts for sisters and friends as well as for me. It is the only thing you need - slips into your jeans pocket and holds everything. One side is folding money - the other is credit cards. The side zipper holds my meds while the bottom zipper holds a spare set of car and house keys. Can't say enough about this coin purse. I buy two at a time so I always have one - usually get red so I see it easily in my purse. You will LOVE IT. To answer all above, We just like them, it's easy to carry and you can also put in a pocket. Yes I we just love them, but only con is not enough colors. It would be great to have some more colors to the mix. I will be buying more, ore,more,more soon! Easy to find in my purse. I use it every day and all the extra pockets are great. I really don't have any cons about this product. KEEP MY CASH,MY CHANGE,MY CREDIT CARDS & MY KEYS IN THIS COMPACT LITTLE PURSE.I LOVE IT!!!! Hold coins bills and confidential information. I like everything about the change purse! I bought two of these, one for myself and one for a gift. I bought the red color after reading a review pointing out that the red color is easy to find in a larger bag, and this is true, and in addition the color is also very nice. I am very pleased with this purchase. I wanted a coin purse, this one is larger than it looks and is fantastic for what I wanted. it has four pockets two large with twist snap closers, two small zippers one on the side and one on the bottom. I keep my cash and change in this and the bright red color is easy to find in my big purse. LOVE this handy change purse for the separate compartments (4 of them) and it holds a bunch of things. I got the red and it is easy to find it in your purse. I love the colors. It has a lot of pockets. A lot of room inside. Great price! Carry it everywhere. This is the best Pouch Purse I have ever bought. There is a pocket for everything If I don't want to carry my purse There is a pocket for My door key, Money , Gas or credit card, and coins too. I can also put the car key in too.How great is that . This is very well made. It's got a compartment for everything. I bought it as a gift and she loves it. This is a cute coin purse that I can take anywhere. Toss in my purse or as is. Slides right in my pocket, when I don't want to carry a purse. Accommodates all my Credit cards, Insurance card, and License. This coin purse can be carried in a pocket or a purse. It has plenty of compartments for coins and paper money. The compartment on the bottem is perfect to hide extra cash in. New coin purse for new handbag. I bought one a few years ago. I loved it so much, I bought one for my mom. I just bought two more, as mine is showing a little wear. It has two main compartments. I use one for coins and one for bills. I keep a nail clipper in the zippered compartment for easy access. i love this product. Been looking for something like this for along time and i finally found it. i love that it has a zip compartment on the bottom. suprise. Nice little leather change purse at a great price. Can take alone without a purse. Holds everything, but yet compact. Was a little bigger than I thought, so can put cards in also. Great item! Reminds me of my grandma's, only mine can hold more. I was shocked by the quality of leather. Great item! I always find what I want. I have one in red and black. I use this coin purse clutch instead of a bulky wallet. It holds what I need to go to work or for errands/shopping. it keeps my change and my bills in one place. I dont need to pull out my wallet in frount pf people at the check outs. lLove the coin purse. Wish it was just a tad wider and that it came in other colors as well. I just might have to order another one just to have a "spare"
Instead of throwing change in handbag, I use this coin purse. This is just right for money cards and fits in my pocket so dont have to always carry a purse. I've been looking for something like this for years. Coins go in one side, bills in the other. Credit cards, driver's license, health insurance card in the zip compartment in the bottom. And there's still a little zip compartment for small other things. Fits in a jeans pocket and fits perfectly in a small purse. I'm back to get two more! Have carried this coin purse as my wallet for 25+ years. I usually buy 2 at a time although they last forever. One side of the purse is folding money and coins, while the other side holds my ID, cc, insurance card, etc. Zippered bottom ideal for spare house and car keys. Love, love, love this coin purse. I buy red....easy to find in purse. Don't ever stop selling these....I'm a customer for life! I love my leather 4 pocket purse. This item is the best and most useful thing I have ever purchased. It keeps my bills and change separate and handy and the extra compartments are perfect for my ID and a spare key. I can locate it easily in my purse and it is so handy for me to grab just to run errends. Buying four more for Christmas gifts. This little purse is very attractive and quite the conversation piece. So much so, I'm ordering four more to give friends who are truly enamored with mine. I knew from the picture I would like this product and it is so useful. I use the zipper on the bottom to hold my driver's license and credit card and gift cards and I do not have any problems with having coins falling out when I flip it upside down to retrieve my credit card. Very well made. great for separating the coins I use when playing games. I have already bought one and loved it so much I wanted another one. Comes in handy for anything. Compartments are convenient,bottom part is used for my keys. I like to tell the cutomers that its great to have in your purse. I searched high and low for this exact product. The only thing I wished is that it came in other colors. I highly recommend these purses. This coin purse is convenient and a good size for times when I don't want to carry a regular purse. Like all the compartments, especially the bottom zip compartment for keys, etc. I am using this purse to hold my reward cards, for various stores. It was a little difficult to open at first, but I worked the clasps, and they are fine now. I needed a good size change purse to double as a wallet when I am taking a small purse to luncheons. This works very well. Very functional, just the right size and the only company online or in a store that had a coin purse at a reasonable price. Good quality. I like all the compartments. Zipper compartment is good. It is larger than I expected and doesn't fit as well in my small bag. I have been looking for a double change purse for decades. They are impossible to find these days. The cross snap closure is so easy to open quickly to access coins. The second compartment is good for separating those pesky pennies. The zip compartment on the bottom comes in handy to put a key or emergency bills. The only criticism is that it's a bit too deep so it's difficult to fish out coins unless you have really long fingers. The 4 pocket pouch purse was a great buy. I had been looking for a change purse for my handbag and this fit what I was looking for plus some. It is much larger than I thought it would be, which I think is perfect. The many pockets and compartments make it very practical. I can use it as a change purse or just by itself to run an quick errand or if I don't want the hassle of bringing my larger purse with me. Driver's license, credit cards and keys all fit comfortably in many of the pockets. The only negatives with it, and they're nothing major, was one of the snaps didn't work perfectly, but with a little twist of the frame that was corrected. Also, I ordered mine in red and it is a much lighter shade than the catalog/internet photo. However, it is still an attractive shade. Overall, I'm happy I purchased this item. A great design. I use it for keeping coins organized and carry it in my purse. I was very disappointed when a lining corner of one compartment ripped. Coins slip through hole and are extremely hard to get out. I plan on using this when we are doing sight-seeing and not wanting to tote around a purse. I like that it has multiple compartments. Just wish the gold plating on the clasps was not so bright. Looks cheap to me... Otherwise, appears to be good quality. I ordered one for myself and one for my daughter to use when we don't want to carry a purse. I did order one red and one black but received 2 black. finally a coin purse that is multi-functional! MAKES A GREAT ADD ON GIFT. IT'S A SMALL PACKAGE WITH MANY FEATURES. I like this product because it allows me to carry all my necessities in one compact location. Love the color (red). seems very cheaply made--but i guess i shouldn't be surprised considering the low cost. It's really really cute on the outside, though, and I love love love all the compartments. It's the perfect size and color (red). Helps me to organize all my cash, my office desk key, and my ATM card. Not what I thought but is still handy. Is not of strong leather; not very sturdy. The Black One Has *Gold* Tone Hardware! The Black Wallet Coin Purse has gold tone mouth and kiss lock, where in the picture above, the hardware is silver tone. The gold/yellow looks really cheap. There's two pockets on top for coins or small items like lipstick/lip balm, eye drops, gum/candy, some keys etc., and the under side has a zippered compartment for either credit cards/driver's license/i.d. and or paper money. The pouch also has a side zippered compartment for coins or other tiny items. It's just average, but hopefully it will help carry more than just a flat wallet. I just wish the quality was a little better. The clasp was so tight that I couldn't open the change purse - neither could my husband! We had to use pliers to loosen and make the purse useable. Leather outside but plastic lined! I thought this was a great buy, outside is leather. However, when it arrived, I sadly found that the inside is just plastic. I would not have purchased this had I known that. Wish it had a clip so I can connect it to my purse when traveling. It would add more safety. I carry it in my purse. The color is good but the snap closure doesn't always close tightly which has disappointed me. I ordered one of these in the past and loved it. However, the clasps on this one aren't well-made and one side does not close properly. It's a good price for real leather but the quality is not good. Very hard to open if you have arthritis or weak fingers. Not using due to difficulty opening it. Not easy to get items in or out too as it is very small inside. I believe the quality is poor. I wanted to use it to carry on credit card and money when shopping. Unfortunately, the coins do not stay in a pocket. They wander into pockets where I have placed credit cards and ID making it difficult to return those items to their pocket. Coins are not available without hunting for them in several pockets. Lining is loose in several places. coin purse nice one "bad smell"
First, the purse is somewhat smaller than the listed dimensions, being 4" W from the top of the clasp and only 5" long, not 5-1/2". This was bought to replace a very similar coin purse I had had for years, but this is smaller. The bottom compartment of this purse is a very tight fit for a credit card. Worst of all, the very same day I received it, the gold across the top started peeling off, it being just a thin layer of gold-colored paper(?). This is a piece of junk, and I can't understand all the good reviews. Too much trouble and expense to return it. Not sewn well. Trim not attached inside purse. White vertical streak on both sides of leather. Stinks. Needed a coin bag for the vendin.g machines in my building and one for my car. Very convenient, organized and extremely useful! As Christmas gifts for co-workers. I like them very much. I ordered them before. I like the quality and the price. I have ordered 5 of these love them keep one in all my vehicles and also gave one to a friend. Love this coin purse!! Do u have flowers? For my mother in law.....it was her choice, similar to the one she had. Can't find my favorite change purse, it has 3 pouches for change, I like to keep my coins separated differently. I know someone with this purse and it is really a great idea. Size and color and clasp and price. Fits inside my larger purse to organize coins. Price and much needed for change for laundry!! appears to be exactly what i've been looking for! I use these to hold change. Mom has been looking for one like this one. It's exactly what my mother was looking for,! Needed a coin purse with multiple storage. Like this type of coin purse and not available in stores. This coin purse is very pretty and, more importantly, it is the size that I've been looking for. Other coin purses were either too small or too large. Been looking for one for my mom & this is the only one I've seen. Finally! I love this but does it have the new credit card protection? Is this available in a larger size? BEST ANSWER: Thank you for your question. This is not RFID protected and is not available in a larger size. We hope this information will be of help to you.